A Funeral Is Being Held For IE6 On March 4. Browser To Be Buried Without The Body. Slowly, but surely, Internet Explorer 6, long the bane of many a web developer, is dying. And you’re invited to its funeral. 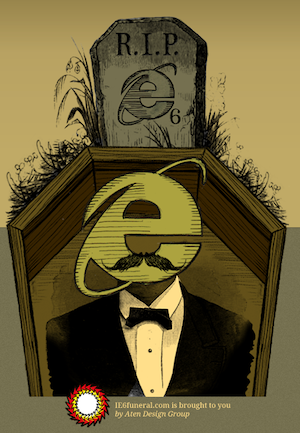 Sadly, this funeral will not actually be the last we heard of IE6. While Google Docs may be ending support on March 1, YouTube won’t kill it off until March 13. And then of course there are tens or hundreds of thousands of sites out there that not only support IE6, but in some cases are built specifically for it. It’s going to be a hard sucker to kill. But at least a funeral will provide some closure until we find the body.